If you play a lot of board games, you may notice that most game designers are male. But there are women who design games, and not “girly” games (which I can only assume means a game about stereotypical girl things like princesses and unicorns that isn’t much of a game at all, according to whoever makes these decisions), but women who design amazing games. Games for everyone, games that are fun and well-made. Anne-Marie De Witt is one of them. She’s the CEO of Fireside Games, and most recently she designed and published The Village Crone. I got the chance to pick her brain about her games, her design process, and her experience as a woman in a predominately male field. Anne-Marie, like so many of us, got into board gaming by playing that quintessential gateway game Settlers of Catan. Her husband Justin started designing games almost immediately, and lo and behold, Castle Panic became a reality. Anne-Marie helped him while also working in the education publishing field. Justin himself had previously worked at Steve Jackson games, so they had experience with what it takes to take a game from an idea to a reality. After helping Justin with the company for a bit, she took a stab at designing her own game. 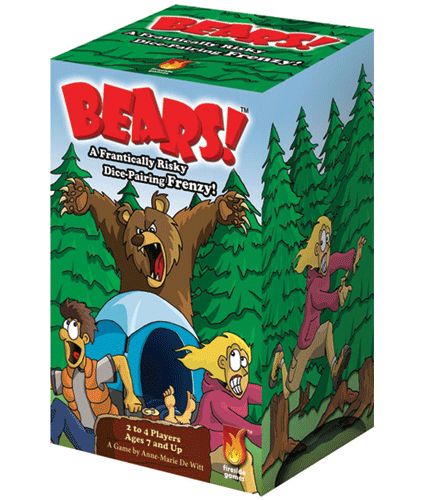 She created Bears!, which is a dice-pairing game in which players try to score points by either shooting bears, running from them, or trying to sleep through the attack. You score more points by trying to sleep through an attack, but if there are bears left at the end of the round, the sleepy campers get eaten. When demoing Bears! at conventions, Anne-Marie says she was often underestimated, possibly because she was a woman. “I’m someone who smiles a lot, and if you smile a lot people think you’re dumb, and they underestimate you. There were times when I would play Bears! that there were certain men who I could tell thought, ‘Oh this is a simple game, I’m going to be able to just wipe you up here.’ And it’s difficult when you demo games to try to lose so people feel good about their experience, and so I started off doing that, and I started realizing there were certain men who think that they’re winning because I’m a simple person, whether that’s because they’re tying that to me being a woman or not, I’m not entirely certain. So I started off losing to them, and then when I would see there was a certain look that they would get, then I would shift and I would start beating the pants off of them. And then they saw like, ‘Oh hey, there is actually some technique to this game,’ and I started getting a different kind of look. There was one convention I was doing that, and I had a bit of a break where I started walking around, and there were some guys kind of standing around and they said ‘Hey, you’re that girl that keeps beating men at that Bears! game aren’t you? And I thought, oh, okay, so is it weird to you because you’re thinking that I don’t know how to demo because I don’t know that I’m supposed to be losing…but you’ve called out my gender, so are you saying that your expectation is that a woman shouldn’t be able to beat a man at a game? In Anne-Marie’s newest game, The Village Crone, her love for witches shines. She says she’s not even completely sure where her idea for the game came from, but that witches have held a special place in her heart and that she’d always wanted to be able to cast spells. 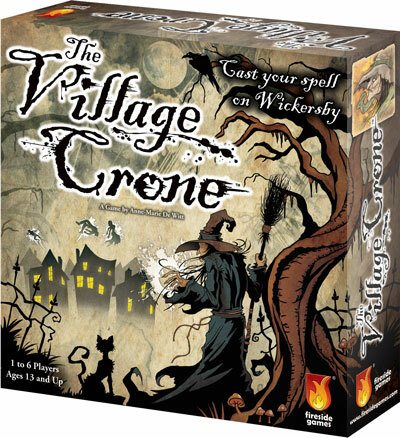 The Village Crone is a worker placement/resource management game where you compete against other witches to become the village crone. You have to cast spells like making villagers fall in love, teleporting them, or turning them into frogs, to complete your “schemes.” The witch who completes the most schemes gets the job as the village crone. The game began to take shape about three years ago, but after some constructive criticism from her husband, it got put on the back burner for a while. Then, a little more than a year ago, Anne-Marie says she had a flash of inspiration, a vision of a medieval village filled with villagers being messed with. So she re-vamped her original idea and got it ready to playtest. In regards to design and playtesting, Anne-Marie sets a grueling schedule for herself. Once she has a playable copy worked up, she does three playtests a week for a month. So one day she’s playtesting, then the next day she’s redesigning and tweaking, all to get ready for the next day of playtesting. Anne-Marie spent a lot of time one of the many aspects of the game that I love. 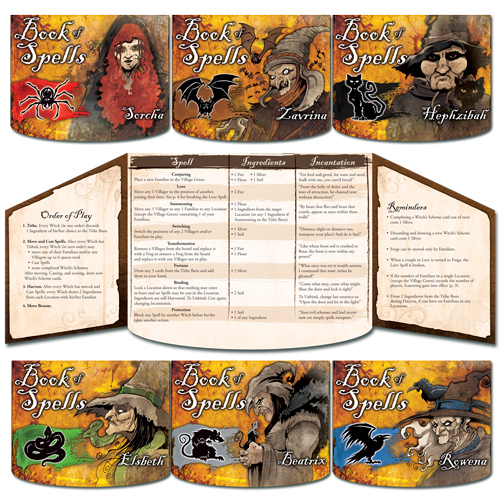 Every time you cast a spell in the game, you have to say an incantation. It took her a lot of time to perfect them, because she not only wanted the incantations to flow and feel magical, but she also wanted them to embody the ingredients the spell needed. So when she was redesigning the game, she often had to change the required spell ingredients, and would therefore have to change up the words of the incantations. The re-design and playtest process is her favorite part of making a game, and she says breaking and rebuilding the game is a very important part of making a game better and more elegant. 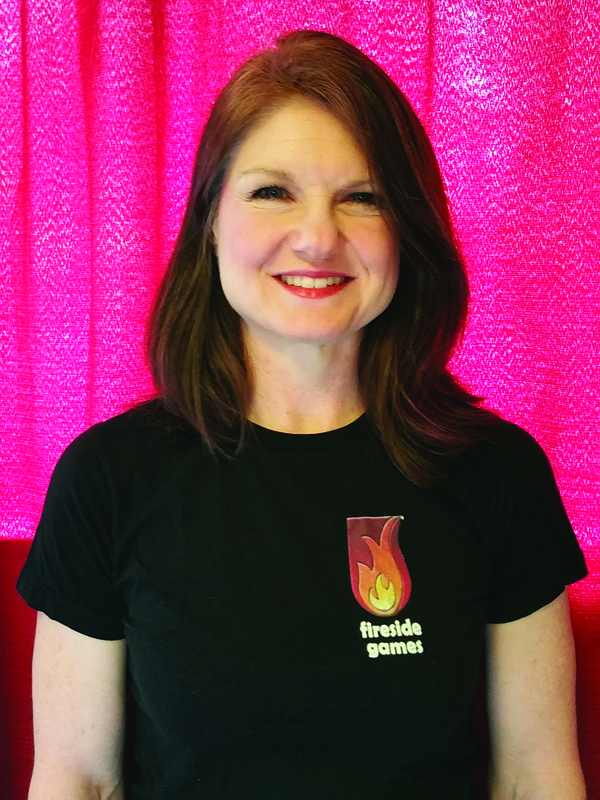 Coming up next for Anne-Marie and Fireside are two new games. They’re working on a stray cat collecting game, which should come out in spring 2016, and a steampunk airship building game. In my next women and board gaming article, I’ll be interviewing Agnieszka Kopera, the co-designer of Exodus: Proxima Centauri, an space empire building strategy game! Great article, the anecdote about doing demos was enlightening! Anne-Marie is great! I have met her many times at game events in Austin. She is always willing to take time to discuss any aspect of their games or the game industry.